Peoples Democratic Party (PDP) contender to the Anambra governorship seat , Andy Uba has flared Ikemba Nnewi, Emaka Odumegwu Ojukwu's statement on his pending case a the Enugu court of appeal, describing Ojukwu as a rascal and war monger who does not believe in democratic principles or rule of law. Uba who spoke in Enugu through his project Director, Chijioke Onyekaonwu stated that all suporters of Andy Uba for Anambra governorship were disappointed to read Ojukwu's call for another war should the appeal court declare Uba as governor-in-waiting. The Biafra war lord had in a press conference in Enugu, weekend, warned that in the event of Appeal court declaring Uba as successor to Governor Peter Obi, there could resume another civil war in the country, particularly in his Anambra home state. But in a swift reaction to Ojukwu's statements, yesterday, Uba said that he was disappointed and shocked for such statements emanating from an Igbo leader like Ikemba. “You see we are in democracy and when you feel offended or shortchanged in any form, you are supposed to seek redress in a court of law. The issue of war, I really wonder where it came from knowing fully well that we that voted Andy Uba in 2007 are still solidly behind him .As a matter of fact we are praying to God to deliver this judgment in his favour because we believe he will deliver. “Now on Ojukwu's case, it amounts to rascality, honestly speaking for a leader, a father to make such statements that is capable causing chaos in Anambra State. Already we have our problems in the state and complicating it will not help us. 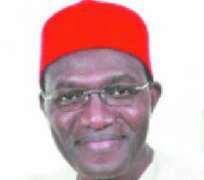 Andy Uba plays the kind of Aminu Kano kind of politics without bitterness. If he feels offended, he will go through a due process to get what he wants which is justice. “So I do not see where Ikemba will get his imaginary war or illusive soldiers. There is nothing like civil war, this is a brother to brother thing. Andy Uba is Anambra person and we are all Anambra people. So I believe that threat of war is not in consonance with modern democracy. We should always think about resolving matters non-violently. War, coup, militancy are obsolete and if our leaders do not see it as their responsibility to create an enabling environment for democracy to thrive, they would have them selves to blame,” said Uba.